How to make contour plots transparent - in matlab R2015a? Hi, how can I make several contourf plots which are transparent? I tried the facealpha but the contour class has no facealpha property. Is there another way to make the contourf plots transparent? One thing to watch out for though is that in versions prior to 14b, contourf created lots of extra polygons. This means that when you set the Alpha on them, it was a bit random what color you actually got. The reason for that was actually the same as the reason that you could mess with the alpha. That version of contourf was implemented using the Patch object. The Patch object does have alpha properties, but it doesn't provide a good way of representing polygons with holes, which are a requirement for doing filled contours well. If you set the alpha properties on those patches, you're going to see all of those blue ones in the back. In 14b and later, contourf is no longer implemented using Patch. This means that it doesn't have to create all of those extra polygons. However, it also means that you can no longer do some of these tricks that depended on the implementation. We are starting to go through and add alpha properties to more objects, not that we've fixed a bunch of these underlying problems. In 15b, we did area, bar, and scatter. We've certainly got contourf on the list, but I don't know which release it will be in. What is the latest state on contourf, have you fixed the problems? Unfortunately, at least up to R2016b, there is no Alpha property implemented for contour objects. As a possible workaround, you may manually define a contour of the area which you want to make transparent. 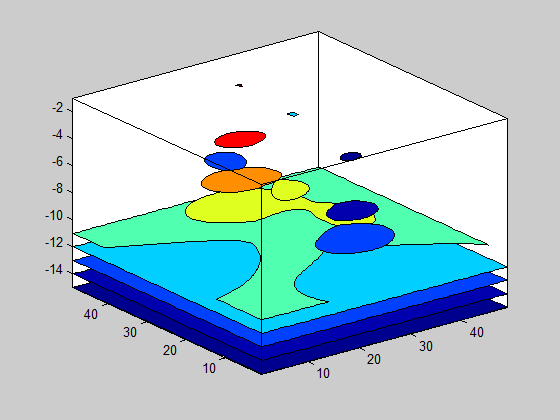 Here is an example where a part of a contour plot is shaded using another contour plot. Is there some news for Matlab 2017a how to do this in a nice way? drawnow; % this is important, to ensure that FacePrims is ready in the next line!